Should You Homeschool Year Round? What is the greatest benefit of homeschooling? Well, there are many. But one of the biggest benefits of homeschooling is the flexibility. Have you ever taken a family vacation in the off-season? If so, then you know exactly what I’m talking about! Most homeschoolers create their own schedule. I’m one of them. The only reason that I ever check the local public school calendar is to find out what days or weeks I should avoid the parks and museums. If school is on break, then you can know for certain that we are buckling down and getting a lot of school done. Then when school is back in session, it’s time for fun field trips again. To help accommodate our travel plans, field trips, and visits from family I usually schooled year round. There were some subjects that we kept working on through the summer. And in other areas, we did some interest-led learning or I choose some different resources to add variety in to our learning. However, I think this summer is going to be a summer with very little homeschooling. Why? I think it’s mainly because I want a bit of a break. And also, we have so many activities crammed into a few short months that I have no idea how I’ll fit in much school. Let me tell you a little bit about our shift from year-round homeschoolers to a family that is taking a more traditional summer break. You can keep working on school subjects all through the summer. When August rolls around, your kids will still remember math facts and how to write a complete sentence. By schooling through the summer, you maintain a consistent routine. It’s not nearly as hard to get back into the homeschool groove in the fall if you’ve never stopped schooling. I don’t know about you, but if my kids have too much free time they tend to whine, complain, and bicker. By keeping part of their time occupied with learning, there is less time for boredom and complaining. If you have a child who you believe to be “behind” in a subject, you can school through the summer to give them extra time to play catch up. And if you have a child who is moving straight ahead, you can keep the momentum going as you work through the summer. If you’ve been schooling year round, you have more freedom to take additional and extended breaks. You can take off the entire month of December or have added time off for vacations during the school year. There are many benefits to year-round schooling. I’ve been a year-round schooler in the past. However, I’ve also learned that there is a lot that can be said for a long break. In the past few years, I’ve scaled our summer school plans way back. Now we just continue learning through the summer with some simple extras. Once our regular curriculum is completed, I just add a few items to our summer lineup. Rarely, do I grab the next level of a curriculum and dive in right away. Nope. I’ve started to follow a more traditional school calendar. Gasp! Can you believe that I’m admitting that I do something similar to a public school? Yes, I think we’re going to do very little over the summer other than swim, golf, and read. Here’s why I’m giving us a summer break this year. We actually live in a climate that has a cold winter. After living in south Texas for years, I preferred to be outside in December and hide from the July heat in my house. It made sense to school through the summer and have longer breaks when the weather was cooler. Now that we are stuck inside during cold winter months, I want to enjoy as much of the beautiful summer weather as possible. I think I’m ready to see the end of a curriculum and know that I get to take a break once we are finished with that level. I am looking forward to having some time off to read and maybe even take some afternoon naps. I know I’ll be ready to start fresh in the fall once I’ve had some down time. I’ve found that as my kids get older, our homeschool schedule has changed quite a bit. We are more mindful of the public school calendar because of our many extracurricular activities. My homeschool days take longer, so I feel like I need longer periods of time off from our routine. Is year-round homeschool right for you? Consider the pros and cons carefully before you make your decision. 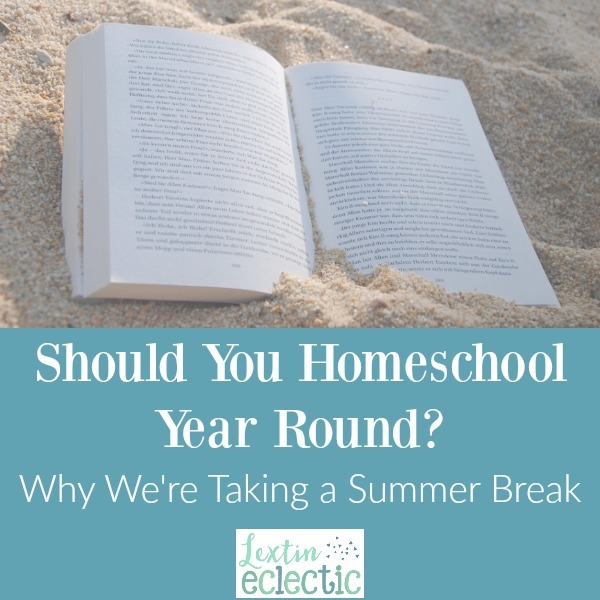 While year-round homeschooling seems fairly popular in many homeschool circles, sometimes a summer break is much needed! Tune in next week as I discuss how we are enjoying our summer break (and sneaking in a little bit of learning too)! We started year round homeschooling because we are in Florida. The heat makes it hard to go out and play in the Summer. I chose to do school with them through the Summer months so they can enjoy the outdoors when it is cooler. We used to do the same thing when we lived in south Texas. We took more time off in the winter when the weather was cooler. Now we are the opposite. We take off the warm summers and do lots of school in the cold wintry months. I love having that flexibility! I’ve never really thought about homeschooling year round and you make some excellent points. We probably won’t because my husband is an assistant principal and so we follow the school calendar to match his off time. Now that my hubby is a professor and has more time off during the summer, it has really made me change my perspective and take more of a summer break. We’re enjoying the family time this year! I’ve been researching and considering homeschooling my children. I never thought to consider schooling year-round but this has given me great points to think about when planning our lessons. Thanks for sharing! You’re welcome! And best of luck as you continue to research homeschooling. It’s a big decision. We really enjoy the opportunity to homeschool. I certainly learn a lot!! I could see that! I tried year-round school for several years but I started to feel a little crazy. I’m really enjoying more time to rest this summer. You raise so many great points! I am not a homeschooling mom in the true definition of the word. However, I am a virtual elementary teacher, which means that my students spend half of their days online with me and half of their days working with their parents at home. I also have a 3-year-old and I have constructed my own “preschool at home” with her. As a classroom teacher, I have taught in both 9-month and 12-month schools. As you mentioned, there are many advantages and disadvantages to both. However, I think that what you are doing this summer is great! So much learning takes place “outside of the classroom” and through shared family experiences. Also, kids need time to just be kids. I say, enjoy your summer! The “classroom” will be there in the fall! That’s so true! My kids are still learning, just not in our usual way. They can still explore and be creative – and I really enjoy the break! Since the Summer months are so brutal in AL we find ourselves staying inside anyway during the summer. We tend to do more school throughout the summer anyway so we just embrace it and go with the flow. With that being said though, we are way more relaxed. You raised valid points for sure, there are many pros and cons. Thank you for sharing! You’re welcome! When we lived in south Texas we did a lot of homeschool during the summer and took more time off during the winter. Now that we live up north we have changed our schedule completely. I love that we have the flexibility to do that. We do a lighter load in the summer & add in some different activities.